How to choose a USB Key | Tech for Lunch! There is no sure-fire way to shop for a key. You will need to decide on the capacity you need and think about some of the features you want, then try to find the best value for money and buy it! Once you have chosen the capacity of your key (depending on what you want to put in it… Pictures? Word documents? Etc. ), you only need to shop around and try to find the best “deal”. There are tons of companies that manufacture them and they are found in a variety of stores. - Over the years, the smaller the keys get, they now offer keys with large storage capacity and the prices are dropping. Good news! 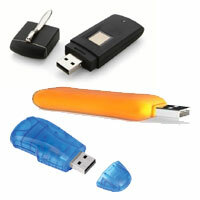 - Generally, the lifespan of data on a USB key is ensured for 10 years. On average, flash memory supports 1 million deletions. - The main available capabilities are: 512MB, 1GB, 2GB, 4GB, 8GB, 16GB and 32GB (very little). After that we fall into hard drives. Prices range from $5 to just over $200. Note: As these data change very quickly, this information may be quickly outdated… Note the date of this article! - Prices vary depending on the capacity, brand, the level of security (with or without a password to access the contents) and the type of key (USB 2.0, USB 2.0 High Speed or U3). - We are moving towards U3 keys that we see more and more of on the market. These keys not only contain various files, but also applications such as software and their parameters (bookmarks, e-mail account, etc.).. Can you imagine? This means we can now bring with us our office (almost) saved on our USB key! At the moment, several free and paid applications are compatible with U3 and it has only just begun. The offer will become more and more interesting… Check the U3 site to find out more and learn about the applications that are available. You may want to consider the form factor of your USB key. For instance, will you be carrying it in your pocket or elsewhere? The shape and the way it opens and closes, the way it can be carried etc, all may have an impact on your decision.